A water leak from around your toilet handle should be fixed as soon as possible. There are two issues that must be addressed: the tank water level and the handle itself. The water level in your tank shouldn't be as high as the handle, so a water level adjustment is needed. 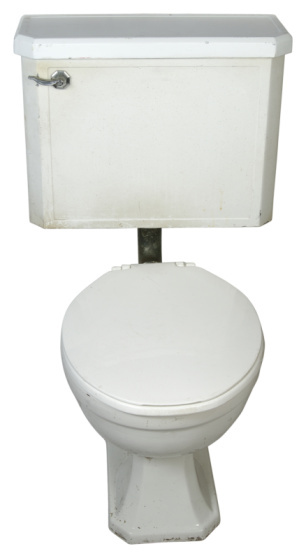 Once that's taken care of, you should replace the toilet handle to help keep the tank sealed tightly. Fix a leaking handle quickly to keep your toilet working properly. Identify the float valve. This will either be a ball type float or an integrated assembly that fits around the fill valve. Adjust the integrated assembly by turning the screw at the top of the fill valve clockwise to lower the water level. Adjust the ball float assembly by carefully bending down the rod connecting the ball float to the fill valve. Flush the toilet. Watch the water level as it fills again. Make further adjustments, if needed, until the water level is below the handle. Unhook the chain from the end of the flush handle. Hold the handle with one hand. With the other, reach inside the tank and loosen the retaining screw on the reverse side of the handle. Pull the screw off the end of the handle rod. Pull the handle out of the front of the tank and thread the handle rod through the hole. Insert the new handle and gasket assembly into the front of the tank. Hold this in place with one hand. Slip the retaining screw over the flush rod and thread it into place on the reverse side of the handle. Reconnect the chain from the flush valve to the handle rod. Flush the toilet and check to ensure that no more water is leaking from the handle. Replace the lid.